A quartet of researchers from the University of Rochester and the University of California has found evidence of the starting period for the solidification of Earth's core. In their paper published in the journal Nature Geoscience, Richard Bono, John Tarduno, Francis Nimmo and Rory Cottrell describe their analysis of ancient crystals found in eastern Canada, what they found, and why they believe their results offer clues about the formation of Earth's inner core. Peter Driscoll, with the Carnegie Institution for Science, has written a News and Views piece on the study in the same journal issue. The work by the researchers involved carefully analyzing plagioclase and clinopyroxene crystals, which have been dated to approximately 565 million years ago. The crystals are important because they contain bits of metal called inclusions. The inclusions are very small and needle-shaped and aligned themselves with the Earth's magnetic field as they became embedded in the crystal. Since the Earth's magnetic field is generated by activity in the inner core, the inclusions are a means of determining the state of the core during the time when the crystals formed. 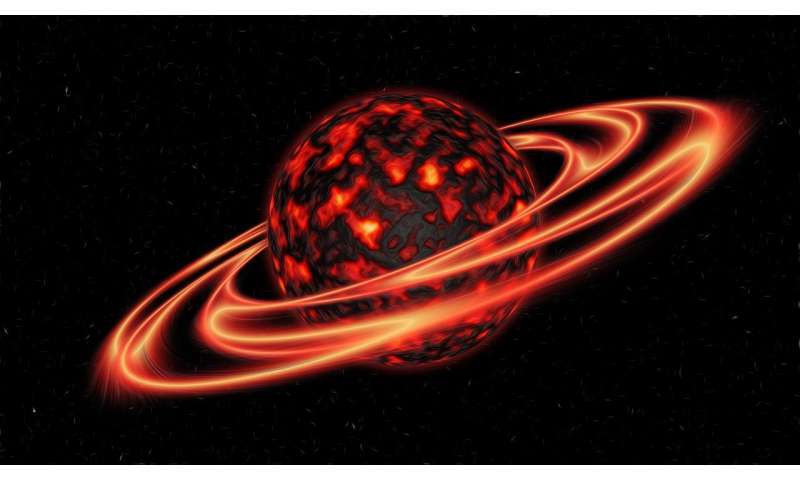 The researchers report that their analysis showed that the magnetic field was significantly weaker than it is today, suggesting that solidification of the core must have occurred soon thereafter or the magnetic field would have collapsed altogether. The reason it did not, theory suggests, is because as the inner core solidified, he magnetic field became stronger.